At TOG, we love hacking, and we have a lot of projects lying around, so we want to try to finish some of them. That’s why we are having a one-day community Hackathon and the theme is Finish a Project! Don’t worry if you have a huge project that might take longer to finish, just finish a part of it. The event is free and open to everyone to attend, if you don’t have a project you can help someone else. 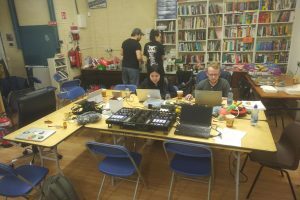 The event will take place from 10AM to 10PM on Saturday, 23rd June in TOG, Dublin’s Hackerspace, 22 Blackpits. The day starts at 10 with breakfast, then you can present your project or join another team. There’s no official prize, but there might be a few unofficial ones, but mainly a sense of achievement. Some people will be working on finishing Dublin Maker projects. Finish an electronics kit you have lying around? Bring whatever you need, there might be some spare parts or components at TOG. Hope to see you on the day, would be helpful if you can register on Meetup or Eventbrite so we have some idea of numbers. Any questions, please ask. This was written by dagda. Posted on Tuesday, June 5, 2018, at 1:23 pm. Filed under Uncategorized. Bookmark the permalink. Follow comments here with the RSS feed. Post a comment or leave a trackback.